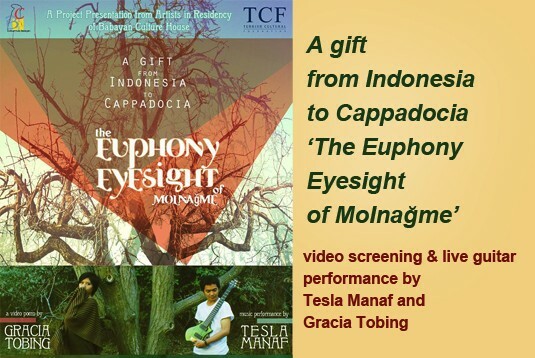 Jazz composer, guitarist, music producer Tesla Manaf (Indonesia) and filmmaker Gracia Tobing (Gracia Octaveni Lumbantobing) will make video screening & live guitar performance in Cappadocia. Born in her lucky number 21st of October, Gracia Tobing has just celebrated her passion in filmmaking after last year graduating college, she illustrates fiction stories poetically based on factual events. The first thing she has to do, dealing with her self-expression limitation. At the age of being born in 1987, Tesla Manaf has created 5 albums that world widely known by the latest album labeled by Moonjune, New York by the compositions based on his own experiences. The last thing he wanted to do, to spread his talent translating other's empathy. This first dialogue between visual expression and responding emotion with notes, has the privilege to explore their collaboration in the area of beautiful volcanic land, Cappadocia, in one month 2015 Artists in Residency, Babayan Culture House. Euphony and Eyesight are the combination of synchronizing the collective thoughts in responding self written fiction story of Molnağme—the Mole who trapped on the underground of darkness—with the daily surroundings in Cappadocia. At the end, the lively experiences they have received from Cappadocia are much beyond expectation. In this regard, those good blessings must be returned as a gift, respect and gratefulness to the land of Cappadocia and the people living beneath. All this shows are open for Public & free entry. The Babayan Culture House is a Netherlands non-profit Foundation based in Amsterdam since 2004 and with a location in İbrahimpaşa (old name Babayan) Cappadocia, Turkey. Objectives are to offer and organize temporary working facilities to professional national and international (visual) artists to enable them to gain inspiration and practical experience in Cappadocia and Turkey as a whole. The Foundation encourages contact between Turkey and the Netherlands, particularly of visual art but also all other art forms, and thereby stimulates intercultural exchange. The Foundation initiates and organizes exhibitions, festivals, workshops, courses, readings, forums, discussion-platforms and meetings of all kinds both in Turkey and in The Netherlands. The environment of the art-residency is Cappadocia, a unique shaped landscape with historical decorated rock churches and pigeon houses cut in the volcanic tufa stone. Cappadocia is an UNESCO world heritage site. The target group for the Babayan Culture House art-residency in Turkey are international and Turkish artists interested in contemporary art and exploratory site-specific or community based arts. Artists are invited to respond in an artistic way to Ecological themes. An attitude of independency in project development is expected of the artists, besides an open mind towards the inter-cultural aspects of the stay. The Babayan Culture House provides any support to create the co-operation between the artists and with local inhabitants and handicraftsmen. Artists can work in cave studios, valleys and abandoned village cave houses. Disciplines and media are: Visual arts, New Media, Music, Educational projects/programs.